Thinking of making the switch to LED lighting? We can provide lighting designs, cost saving reports and provide expert advice on the leading lighting brands, their products and suitability. We are very experienced in carrying out rewires due to years working on a large rewire only contract. We know it’s an unwanted job for most property owners so we try to make it as painless as possible ensuring we work in an efficient and tidy manner with little disruption. We all rely so heavily on our electrical gadgets nowadays. We can change your old single socket to a double socket with a USB port to charge your smartphone or tablet. We undertake all work, from moving a socket to full accessory changes. Fixed prices for tests with full reports provided. Any remedial work is quoted where necessary or a final certificate produced showing the property has passed. Ensuring your property is up to current standards. Reduces the risks of dangers in the home due to electrical faults, making your home safer. Excellent work done to a high standard. It was a great customer experience and everything was explained clearly. I will use Amps Electrical again without hesitation. New consumer unit and electric towel radiator installed. Responded to an emergency call very quickly identified the problem and fixed it by replacing fuse board. Thoroughly tested before leaving premises. Changed fuse board, fitted lamp, light fitting. Amps Electrical is an Introducer Appointed Representative and provides a pure client Introduction through Improveasy Ltd., a company registered in England and Wales (Co. Reg. number 7807352). Registered Office: Manchester Business Park, 3000 Aviator Way, Manchester M22 5TG. The firm is authorised and regulated by the Financial Conduct Authority (FRN 708623). The firm is authorised as a Lender (limited only to green deal finance plans). It also acts as a Broker, not a Lender, and offers credit facilities from a panel/one lender. The credit is subject to application and status. By using this contact form I accept my data will be stored in compliance with GDPR and the privacy notice which can be viewed on this website. 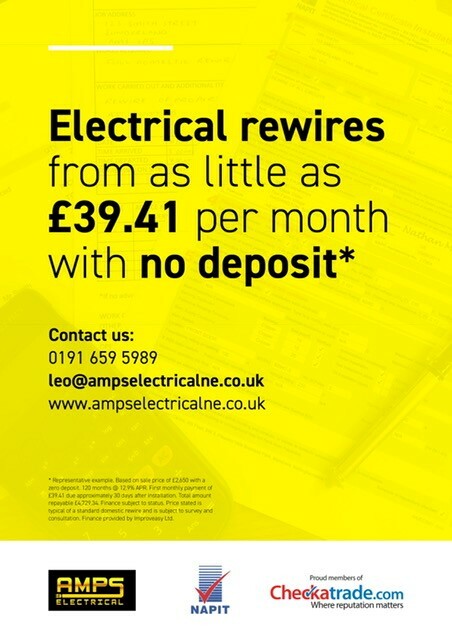 I also give permission for Amps Electrical NE Ltd to contact me further to this request.